Normallly when your hard disk storage is running low, you will come out with all sorts of methods to see if there is anyway to clean up junk or duplicated files before deciding to upgrade to a bigger size storage drive. If you tends to keep mostly picture files but are mixed up in unorganized manner with potential that some duplicates have occupied quite a huge portion of your hard disk space, then this software tool may be able to help you. Named as VisiPics, it is a free tool that can help you to scan through your system memory for all types of the picture files and figure out if there is any duplication and eventually allows you to delete them to save some hard disk space. 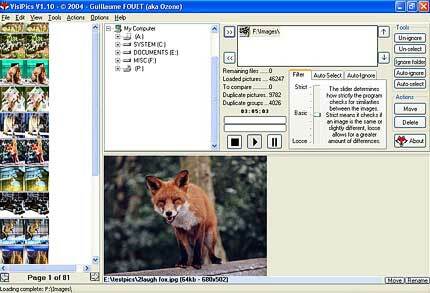 The software utility is quite powerful that can scan through various types of media files such as BMP, JPG, PCX, TIFF and even RAW files and list down duplicated files side by side for easy comparison. Users can select to manually delete them or do a predefined criteria such as just delete smaller size files so that it will do whatever is necessary to clean up your hard disk space. Some of the files that are saved in different resolutions or those that already being converted to different formats will also be considered as duplicated files. That is not all, there is a way to customize the similarity levels based on own preference. Take note that there is a minimum system requirement in order for this software to work accordingly. Your system must be a Pentium system with 128MB or above, running with Windows 2000/2003/XP or Vista OS (Operating Systems). Do try to download here to see how much it can help you.